Rebecca has been a licensed insurance agent with Compare.com for two years — although “agent” isn’t her preferred term. “I’m an insurance educator,” she says. She loves helping people find the best insurance rates for a plan that also works hard to protect them. Compare.com’s insurance agents aren’t paid on commission. “So if your policy’s $500 or $50, it doesn’t matter to me!” Rebecca says. 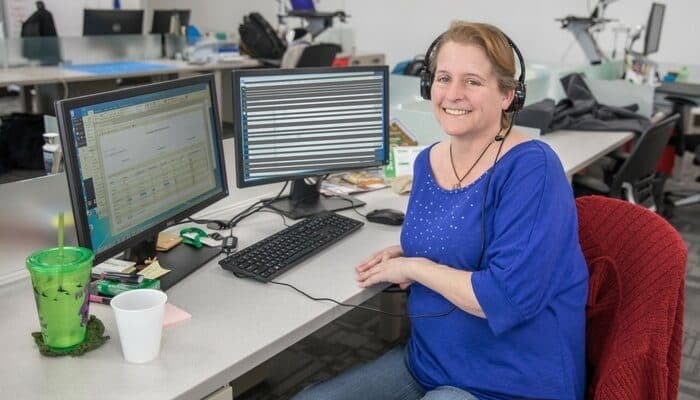 “I just want to make sure you have what you need.” Here are a few of the insider tips she shares with Compare.com customers to help them successfully compare car insurance quotes and purchase the best policy. Before any insurance company actually gives you coverage, they’re going to run your MVR (motor vehicle report), which will reveal any incidents on your driving record. If incidents appear, your rate will go up. It’s better to enter those up front, in the quote process, so you can get more accurate quotes. People often call us when their current insurer raises their rates because of an accident or claim. The bad news is that the incident will make their insurance more expensive for a while — usually three years for tickets, five years for accidents. “The good news is, it may be a little bit higher at first, but comparing prices can stop your rate going up too much,” Rebecca says. A lot of people have no idea what their car insurance covers. They just want to know that they have “full coverage,” Rebecca says — but what does that even mean? “People see ‘full coverage’ and they think they have to have roadside assistance, they have to have rental car coverage. They don’t. Those are optional,” she explains. “Full coverage is: You have to have the state requirement, and if you’re financing, you have to have the lienholder requirement. No one cares if you have roadside and rental!” So if you’re trying to find the cheapest car insurance rates on Compare.com, drop roadside and rental. Plus, if you drive a new car, chances are those services are covered under your warranty. Usually, the lienholder on a new vehicle — the bank that issued the car loan — is going to require a maximum deductible of $500 on comprehensive and collision coverage (that’s the part of your insurance that protects your car). So when you select a $1,000 deductible to get the best car insurance rates, but your lienholder insists on a lower deductible, that’s going to raise your premium. Before buying a policy, check with your car loan company to see what’s required. A lot of people say they want a car insurance company with physical locations nearby, so they can walk in and pay their bill. But having a local office isn’t always desirable, she tells them. With a company that has 2,000 offices, “your insurance rates are reflecting their overhead. You’re paying their power bill, you’re paying their water bill, you’re paying their employees.” Companies that do more business online deliver the same or better service — and if you have an accident, they have adjustors all over the country to help you, quickly. Recently, Rebecca was talking to a woman who was a retired truck driver and rented an apartment in a senior citizen community. She owned a 1995 Honda Civic and drove less than 4,000 miles each year. But her current company had her paying for a 100/300/100 policy. That’s $100,000 bodily injury per person and $300,000 per accident, plus $100,000 in property damage liability. “She’s on a fixed income,” Rebecca says. “And I asked, ‘Why do you have limits this high? Do you see $100,000 vehicles driving around your neighborhood?’” For this particular driver, who had few assets and an older car, the 30/60/15 minimum coverage required in her state was probably enough. A homeowner should have at least 100/300 or even 250/500 liability insurance limits, she says: “It’s not just for your protection, it’s for your family.” When people object, saying it’s too expensive, Rebecca says, “Well, do you buy a Starbucks coffee every day? Bumping your limits up to 100/300 is about the price of a cup of coffee every day.” Your rates will depend on multiple factors, of course, including your driving record and your age. Let’s say your car gets sideswiped by a hit and run driver in the grocery store parking lot. Sure, you can pay for the damage by filing a collision claim on your own policy — but you’ll pay a $500-$1,000 deductible out of pocket, and your rates may go up. If you have uninsured motorist property damage coverage in Virginia, on the other hand, it’s just a $200 standard deductible. That’s subtracted from the check the insurance company sends you and it won’t affect your insurance premiums. Another perk most people don’t realize, Rebecca says, is that uninsured/underinsured coverage doesn’t follow the car. It follows the person. That means your UM/UIM coverage protects you even if you’re in a friend’s car, on a city bus or even on a bike. Just like gas prices, insurance rates change daily. The quote you get today won’t be valid after midnight — and tomorrow’s quotes could be higher or lower. If your insurance is currently lapsed, don’t delay in buying a new policy! The longer the lapse, the higher your rates will be. And sometimes rates go up not because of anything you did, but only because the insurance company has changed its algorithms. This means that once you find the best car insurance rates on Compare.com, you should go ahead and purchase. For more insider tips on switching insurers, read our interview with Compare.com agent, Thom. We’re happy to help you figure out the right policy for your needs. Whether that’s answering a question about what comprehensive is or understanding bodily injury. Call (877)294-2734 to speak to Rebecca or any of our knowledgeable advisors!